Last summer I bought a boat and sailed it with friends from South-Brittany to North Holland. 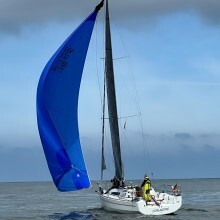 I then spent some time on the water and sailed either alone or with a friend around the dutch north sea islands. Now I feel the next step for me is working towards the yachtmaster offshore exam. I am looking for a yachtmaster instructor who can teach me on my boat. I would be happy to combine this with sailing to some places I haven't been yet. This could be for example the UK south or east coast or Norway or again France. I am very flexible about starting dates and length of this journey (maybe something from 1-3 weeks). The boat should have all necessary equipment. (Autopilot, AIS, Liferaft, EPIRB, VHF).